A Board Certified Orthopaedic Spine Surgeon, Dr. Michael D. Dabbah is fellowship trained in Spine Surgery and Specializes in the Operative and Non-Operative care of all Neck and Back Pain. He addresses all problems with the Cervical, Thoracic, Lumbar Spine from Scoliosis to Minimally Invasive Spine Surgery. 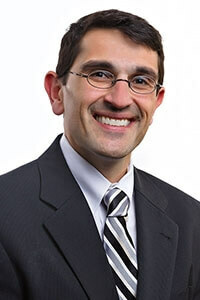 Dr. Dabbah received his bachelor degree from the University of Maryland. His Medical school and Orthopaedic residency were complete at Penn State Hershey Medical Center. After which he completed a one-year fellowship in Spine Surgery at Saint Joseph Medical Center. Black, KP, Schneider DJ, Demarco, C, Dabbah, M. Evaluation of an Animal Model for the Study of Shoulder Instability. Presented as a Poster at the 7th International Congress on Surgery of the Shoulder, held in Sydney, Australia; Oct 5-9 1998. Fayazi AH, Ludwig SC, Gelb DE, Dabbah M. Preliminary results of staged anterior debridement and reconstruction using titanium mesh cages in the treatment of thoracolumbar vertebral osteomyelitis.Spine J. 2004 Jul-Aug;4(4):388-95. Weiner BK, Dabbah, M. Lateral lumbar disc herniations treated with a paraspinal approach: an independent assessment of longer-term outcomes.J Spinal Disord Tech. 2005 Dec;18(6):519-21. McAfee PC, Cunningham BW, Hayes V, Sidiqi F, Dabbah M, Sefter JC, Hu N, Beatson H. Biomechanical analysis of rotational motions after disc arthroplasty: implications for patients with adult deformities.Spine. 2006 Sep1;31(19 Suppl):S1 52-60. Please tell us about YOUR experience with Dr. Dabbah! Don't know if you remember me, but you saw me at 301 Plumtree in June for my neck problems. I haven't been to too many docs in my life but, have worked with hundreds - you are a kind being - I trust you, and coming from an old NURSE, that means a lot! I'll see you soon. Continue what you are doing - it's wonderful! Thank you and Peace. -- Bonnie W.
Dear Dr. Dabbah, Thank you for taking me as your patient. You are well known as a skilled surgeon, but you are also to be applauded for your compassion and generosity. I am sure it was not easy to listen to me complain, but you were always very kind. I appreciate that you are responsible for each step I take and I will always be grateful. -- Nancy W.
Dr Dabbah: Thank you so much for giving me a new life. May many patients gain their strength from you! -- Patient, Naixiany L.